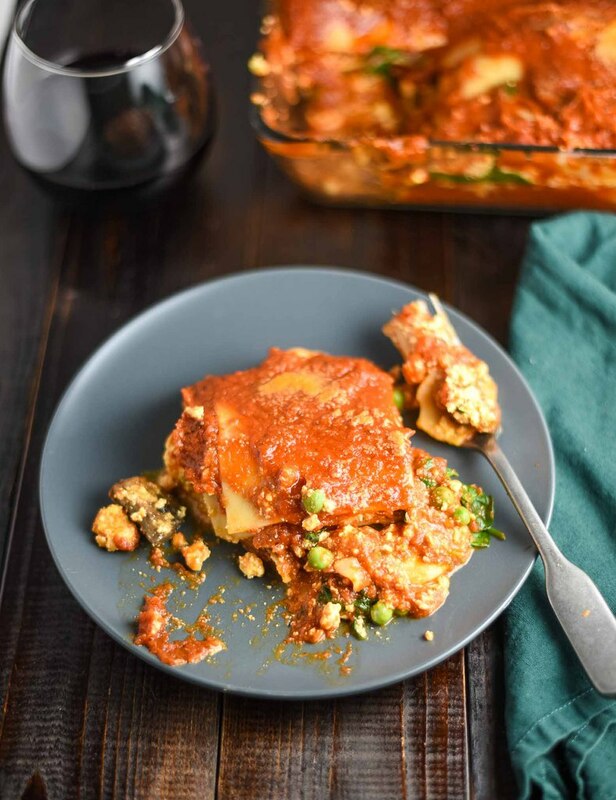 This vegan lasagna is jam-packed with tofu ricotta and fresh spinach, peas, mushrooms, and zucchini. I used all fresh veggies to up the healthy factor and then loaded it with tofu ricotta for creaminess and a protein punch. This recipe is a great choice for meal prepping if you want plenty of leftovers to get you through the week–also ideal for a low maintenance, one-dish dinner party. what do you put in vegan lasagna? The great thing about vegan lasagna is that it’s healthier than regular lasagna (subtext: you can eat more of it without the physical and emotional repercussions). Instead of being meat and cheese-focused, which ups cholesterol without adding a lot of nutritional value, you’re eating veggies and getting a ton of protein from the tofu ricotta. I added fresh spinach, mushrooms, peas, and zucchini to the veggie mix, but you can also try fresh bell peppers, onions, or different types of squash for delicious vegetable lasagna variations. how do you make vegan lasagna? Lasagna can be intimidating. I get it. How do you do the layers? How do you know the appropriate volume of ingredients to add? Luckily, this recipe answers all of those questions for you. Chop the veggies and sauté for a few minutes. In a separate bowl, make the tofu ricotta which involves a part of cooking that I always enjoy – getting your hands dirty. Simply mix the ingredients and crumble the tofu with your hands until you’ve got a mixture that resembles ricotta. Finally, for the assembly — add marinara to the pan, put down your first layer of cooked lasagna sheets, add veggies and tofu ricotta, cover in more marinara, add the top layer of lasagna sheets, and then repeat. You’re now a lasagna master. 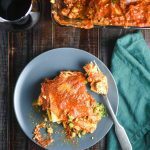 what do I serve with vegan lasagna? Now we’re getting to the fun stuff. First and foremost, wine. But more on that later. Side salads are always a good idea with pasta to keep things light. Garlic bread is another popular option and great for mopping up extra sauce. 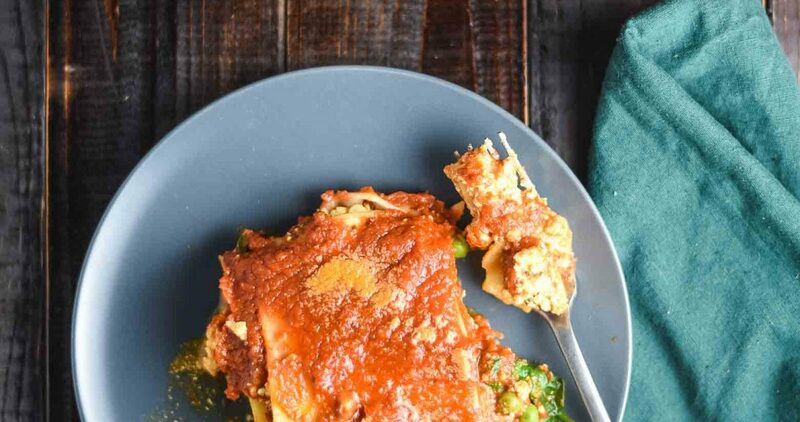 If you’re in the mood for pasta but are aren’t sold on lasagna, check out these vegan stuffed shells, creamy avocado pasta, broccoli cauliflower pasta with tahini sauce, or baked ziti. 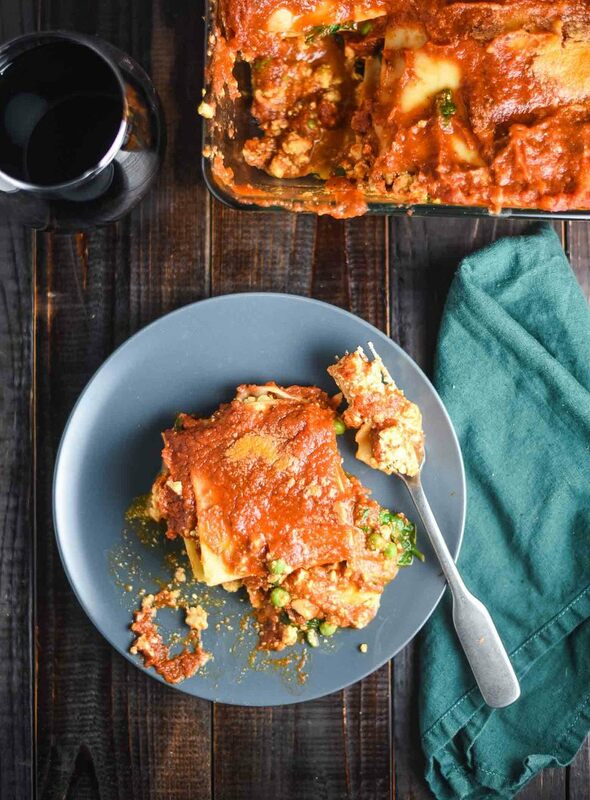 If you make this vegan lasagna and drink some wine, let me know how it goes! Leave a comment, rate it, and don’t forget to tag a photo #plantandvine on Instagram. Sangiovese: Sangiovese has the acid and tannin to stand up to the heavy serving of marinara sauce. It brings savory olive and leather flavors, which adds to the rustic flavor profile of the lasagna. Look for a Chianti Classico, which is 80% Sangiovese. Barbera: Another Italian red, with high acid but not as much tannin as Sangiovese. Brings black cherry, plum, nutmeg, lavender, and anise flavors to the meal. Tempranillo: If you want to branch out of Italy, look for Spanish Tempranillos. When young, they’re fresh and fruity. When aged, they taste like leather, tobacco, and dust (yes, dust). Pick your speed! 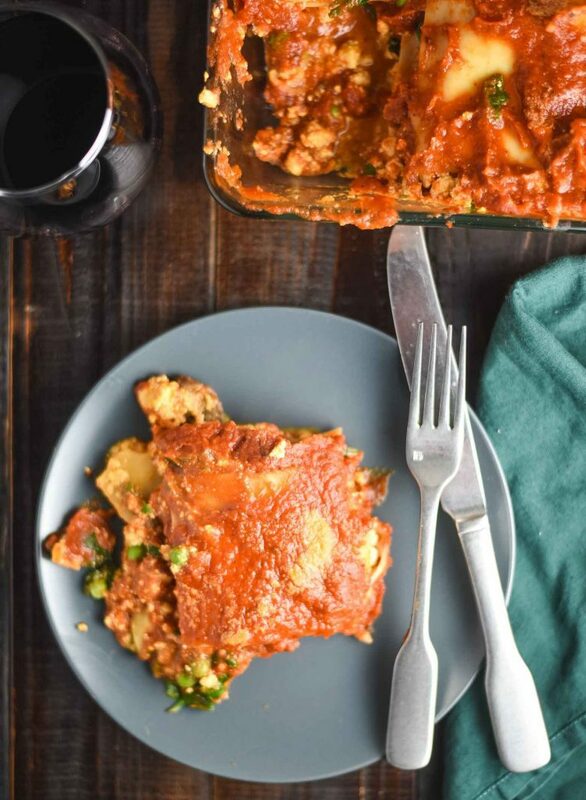 Healthy vegan lasagna with tofu ricotta recipe – perfect for a special dinner with friends. Press tofu to absorb excess water. I typically lightly wrap the tofu blocks in paper towels and put them on a plate. Then, place a heavy object, like a cast iron skillet, on top of them for a minimum of 20 minutes (30-60 minutes is ideal). Bring a large pot of salted water to a boil. Add lasagna sheets and cook per package instructions, until al dente. Drain and rinse with cold water. Set aside. While pasta is cooking, heat oil over medium heat in a large skillet. 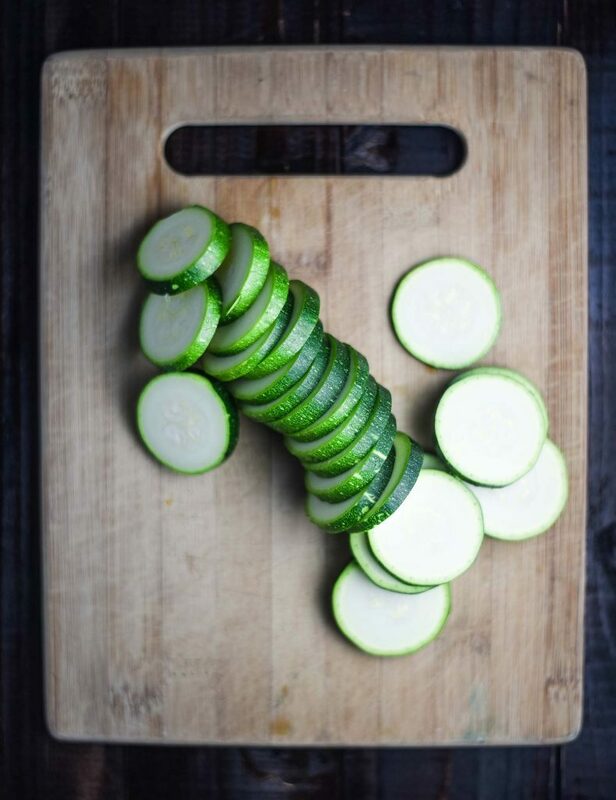 Once hot, add zucchini and mushrooms and season generously with salt and pepper. Sauté for 3-5 minutes, until softened. Add spinach and peas and sauté for another 3-5 minutes, until spinach has wilted and is soft. Remove from heat. Place drained tofu in a large bowl. Crumble with hands. Add hummus, nutritional yeast, basil, salt, and garlic powder. Stir together with your hands until it resembles ricotta. Because the tofu is firm, this takes some effort to smooth out the texture. Pour marinara sauce in a separate bowl and add dried basil, oregano, and thyme. Mix until evenly dispersed. If you have any other spices or herbs that you like in Italian pasta, feel free to add them to the sauce. Lightly grease the bottom and sides of a 9×13 baking dish. Place about 1 1/2 cups of marinara in the bottom and make sure bottom of pan is fully coated. Top with 4 lasagna sheets, I did 3 sheets side by side and one sheet to fill the gap at the end. The goal is to make sure there is a solid layer of noodles. Add half of the ricotta mixture and half of the vegetable mixture. Top with 1 1/2 cups of marinara. Repeat with more noodles, tofu ricotta, and veggies. Then top with one last layer of noodles and another 1½ cups or more of sauce. Top with a sprinkle of nutritional yeast. To serve, top with fresh basil and vegan parmesan cheese. To store, keep in covered container in refrigerator up to 4 days.